In the past month Jupiter's South Equatorial Belt, a ribbon of red nearly 18,000 miles wide, disappeared from telescopes. 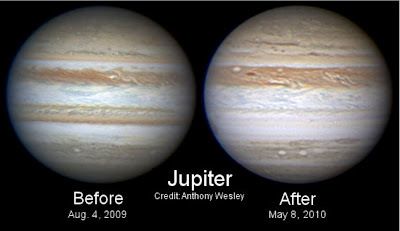 The disappearance was monitored by Australia's Anthony Wesley, who also discovered a comet striking Jupiter in 2009. No one knows what happened to the stripe, whether it has truly vanished or just been covered by a cloud layer. Scientists do not understand what happens in Jupiter's upper atmosphere, much less the planet's interior. Jupiter's gigantic storms, cloud bands and Red Spots are powered by mysterious forces in the planet interior. The largest planet gives off twice as much radiation as it receives from the Sun. It is hard to imagine what could be generating this much energy, but Jupiter's core would be a good place to find a Black Hole. A small singularity would produce heat, a magnetic field, and the vortices of stormy Jupiter. Wonderful images. 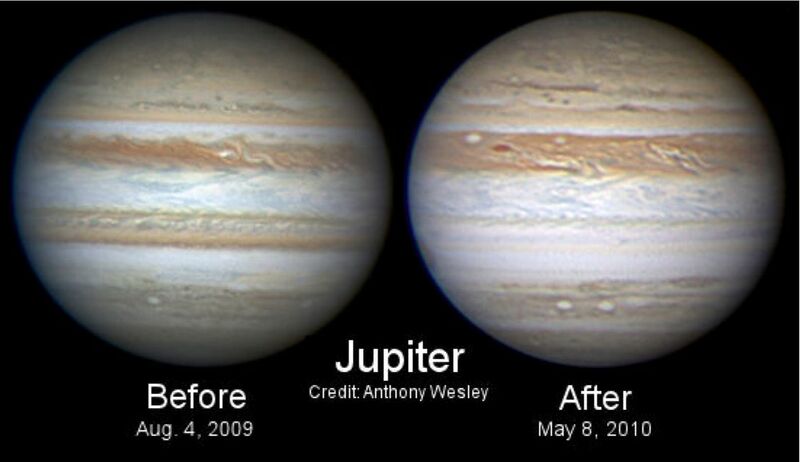 I recall looking at Jupiter through the 1m telescope at Mt John, when I was living there in 2008. The red bands were quite distinctive, so it is a pity to see this one go! That is precisely what Jupiter's core is, a black hole, just like the rest of the cores of almost every body you see in the Universe, everything is practically a black hole in different scales. Listen to Nassim Haramein to see what he has to say. Awesome picture by the way. 0810jejeCertains baskets femme nike air max thea dunks Nike sont extrêmement légers aussi! Bercer les rues asics chaussure basse avec ces chaussures de sport. asics bleu pas cher Nike annonce qu'elle lancera un air jordan 1 low france Nike Hyperdunk + en juillet 2012. air jordan 11 legend blue femme Un bon briquet doit être adidas zx flux adv homme capable de s'attaquer à une basket adidas originals zx 500 og table de cigares qui ne fume pas. Who Is a Time Lord?